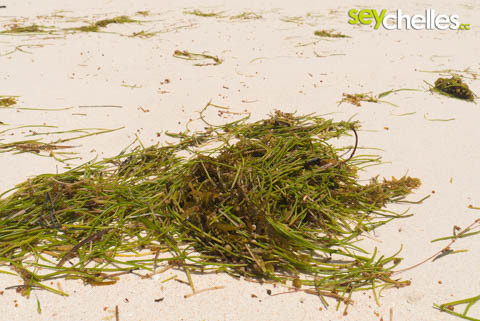 seagrass or seaweed is growing in the shallow lagoons near many beaches and is absolutely natural. Depending on the season, weather, wind and the side of the island, seagrass can be washed ashore. It may disturb your view of a pristine white sandy beach. But don´t be disappointed, on the other side of the island, it may be different. Keep in mind that seaweed on the beach is totally natural. Tiny animals love and need it to find food. Seahorses in the sea and hermit crabs or other crabs on the beach. Small birds also find insects or other yummy things in it and even turtles tend to eat from swimming seaweed. If the seaweed is dry, take your sunbath a few meters away because mosquitos tend to love it too ;-).